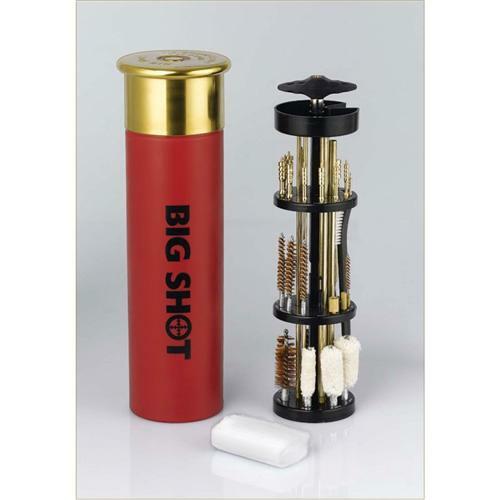 The Big Shot 89-piece Deluxe Universal Gun Cleaning Kit stores in a 13-inch shot shell case, cleans all rifles, shotguns, and handguns. Brass rods, brushes, mops, and fitting included. Complete with 12-piece jag set for .17 to .45 caliber. Handy, convenient, and attractive display; makes a great gift for any hunter or gun collector. All Brushes, Mops and Fittings Included. Cleans Majority of All Rifles, Pistols and Shotgunsfrom 17 cal. to 12 ga. Shot Gun Shell storage case with stainless steel lid. Rustproof stainless steel and durable Polypropylenethat will last for years. 12-piece Solid Brass Cleaning Jags from 17 to 45cal. 3 Solid brass rod for shotguns. 3 Solid brass rod for rifles and pistols. 1 Universal handle. (Patent Pending)1 Nylon cleaning brush. 2 Solid brass adaptors for Shotgun brushes/mopsand rifle/pistol brushes/mops. 10 Brass wire brushes to fit 12 gauge, 20 gauge, 410gauge, 45 cal., 40 cal., .22 cal., .17 cal., .357/.38cal./9mm, 30 cal. and 270 cal. 5 Mops to fit 12 gauge, 20 gauge, 410 gauge, .357/.38cal./9mm and .22 cal. 2 Plastic slotted ends for Shotguns and Rifles/Pistols. 12-piece Solid Brass Cleaning Jags: 17, 22, 6mm,25-6.5mm, 270-7mm, 30-32, 8mm-338, 35-9mm, 375,40-416, 44 and 45.